With handheld game systems like the Nintendo 3DS readily available, it’s hard to imagine kids choosing to play with something like flashlights. 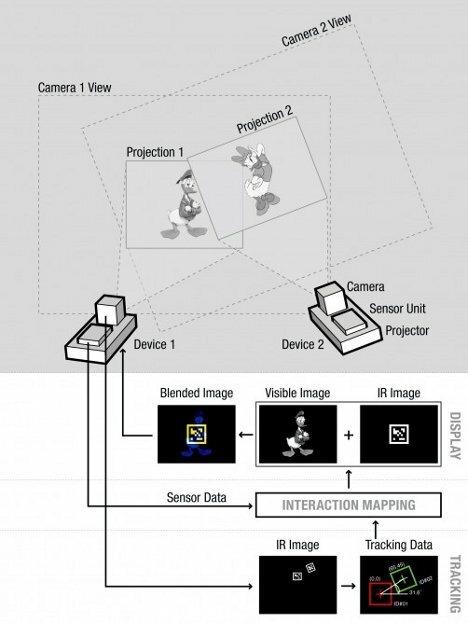 But researchers from Disney and Carnegie Mellon University have developed an interactive gaming system that is very similar to a pair of flashlights playing on a wall. Each SideBySide handheld device includes a pico projector, a camera, visible and infrared light emitters, and a proximity detector. 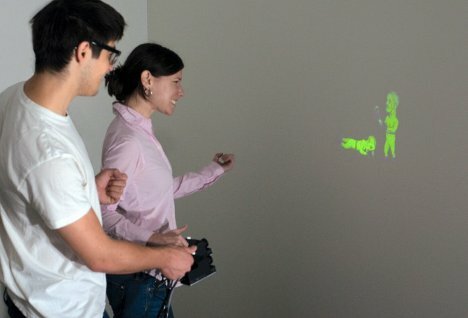 You and a friend both shine your devices onto a wall or other flat surface and watch as the projected characters start interacting. Some of the games demonstrated on the system look rather amusing: a boxing game, one where an airplane tries to throw a net over a giant gorilla, and a cooperative game where both players guide baby birds into a nest are a few of the games in development. The team responsible for the SideBySide says that the system could be used for other things, too: transferring files, teaching intellectual skills to kids, and examining 3D models. See more in Gaming & Geek or under Gadgets. January, 2012.